Henan Billions announced that USD1.34 billion for acquisition of Sichuan Lomon was in place in late Sept. 2016, and that it would materially proceed the acquisition based on the sum. With the acquisition funds being in place, Henan Billions is expected to become the first global TiO2 giant in China, according to analyst CCM. In late Sept. 2016, Henan Billions Chemicals Co., Ltd. (Henan Billions) announced that a sum of USD1.34 billion aimed at being raised in the 2015 private placement, was in place, and that the fund would be used to proceed the acquisition of Sichuan Lomon Titanium Co., Ltd. (Sichuan Lomon) materially. 1. Input about USD1.34 billion in acquiring 1.20 billion shares (= 99.99% of the total) of Sichuan Lomon. Specifically, USD537.25 million will be paid to Li Jiaquan, president of Sichuan Lomon Corporation (Lomon Corporation) for 480 million shares, USD360.82 million to Lomon Corporation for 322.36 million shares and USD444.93 million to Tibet Lomon Investment Co., Ltd. for 397.52 million shares. 2. Use about USD134.31 thousand to increase capital in its fully-owned subsidiary Jiaozuo Xintai Resource Comprehensive Use Co., Ltd. (Xintai Resource). Then Xintai Resource will use this fund to acquire 120 thousand shares (= 0.01% of the total) from Lomon Corporation. Reportedly they have already signed supplement agreements accordingly. From this acquisition, Henan Billions will directly hold 99.99% of shares in Sichuan Lomon, and via its Xintai Resource, will indirectly hold the rest 0.01% stake. That is to say, Sichuan Lomon will become a stock corporation controlled jointly by Henan Billions and its subsidiary. 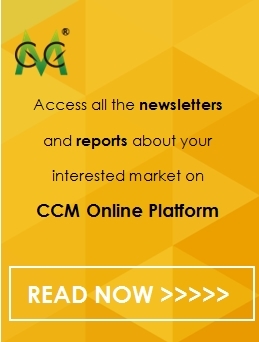 “In light of Sichuan Lomon’s profitability which is second to none in China’s TiO2 industry, Henan Billions, following the full receipt of fund, will accelerate its acquisition,” stated Dean Wu, editor of Titanium Dioxide China Monthly Report, CCM. “Evidently, Sichuan Lomon’s excellent financial performance will contribute largely to Henan Billions’ combined figures,” Dean said. In 2015 when domestic TiO2 business fell into historic trough, Sichuan Lomon still made net profit of USD94.32 million, far beyond USD16.57 million of Henan Billions. However, Henan Billions still maintained its leading role compared to most of TiO2 manufacturers in China, such as CNNC Hua Yuan Titanium Dioxide Co., Ltd. and Anhui Annada Titanium Industry Co., Ltd. which made net loss of USD18.80 million and USD20.59 million respectively. 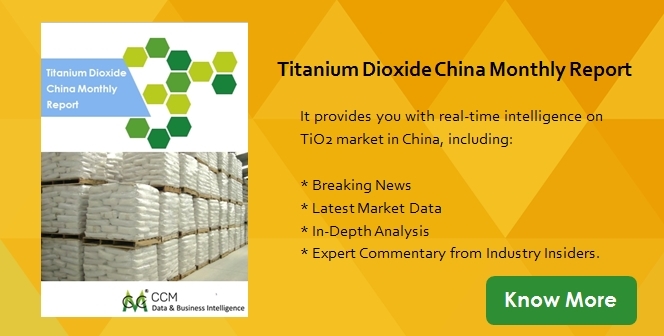 This year, 2016, saw 10-round price rises in TiO2 price. This certainly is good for Sichuan Lomon to make more profits. On 14 Sept., 2016, Henan Billions and Sichuan Lomon announced rutile TiO2 price hikes: +USD74.87/t for domestic clients and +USD50/t for foreign ones. 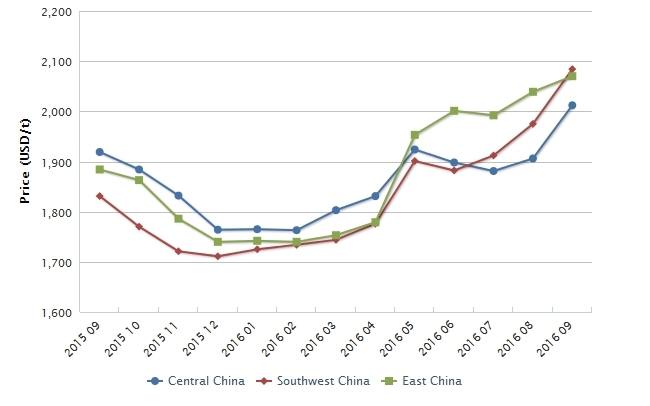 This signals the 10th round of price rises in China this year. Prior to this, in early Sept., key manufacturers, such as Shandong Doguide Group Co., Ltd. (Shandong Doguide), Jilin GPRO Titanium Industry Co., Ltd. and Jinan Yuxing Chemical Co., Ltd., had already raised their prices. Following this, the price of rutile TiO2 now stands at USD673.81/t, up by nearly 50% over early 2016. “That’s to say, if Henan Billions speeds up the acquisition even one minute earlier, it will have more positive financial figures in its consolidated financial statements. Remarkable financial data and high profits, undoubtedly, are short-run results strongly expected by Henan Billions from this acquisition,” said Dean. 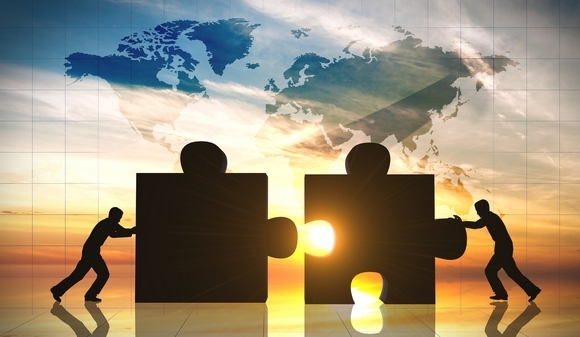 In view of market competitiveness, the pros of this acquisition will outweigh the cons provided the acquisition is finished as early as possible. An unshakeable TiO2 “monolith” will have been forged in China following the merger of Henan Billions and Sichuan Lomon. Particularly against the backdrop of the continually increasing TiO2 price, having the absolute say on price is of course of great importance. Moreover, Sichuan Lomon’s advantage in terms of minerals resources will be made use of to a larger extent, even if both companies choose to maintain independent business operations at first following the acquisition. Both enterprises will also be able to complement each other in terms of technological resources and sales channels. “Take a step back, even if China’s TiO2 business does not maintain its upturn in 2017, and prices decline significantly, Henan Billions will have no need to take the risks brought by acquisition of Sichuan Lomon,” stated Dean. In May 2015, when Henan Billions officially announced they were to acquire Sichuan Lomon, the latter ever made promises regarding its financial performance: it predicted it would make a net profit of USD104.47million in 2015, USD134.31 million in 2016, and USD164.16 million in 2017. If there were discrepancies, the company said, they would be made up by original shareholders. In 2015, Henan Billions received USD10.14 million in compensation from Sichuan Lomon, which was then used by Henan Billions to supplement the working capital of Sichuan Lomon. “It is believed that Henan Billions will spare no efforts to speed up the acquisition because it is for sure the biggest gainer in this acquisition,” Dean added.